With its divided lamp body made of cast aluminium, the IP44.de Yo resembles the letter “Y” or the Victory hand gesture. However, in spite of the strong symbolism, the wall light is characterised by a rather subtle charm. Each of the lamp “arms” is equipped with a powerful LED module which is covered by a sheet of semi-transparent safety glass. In this way, the wall light by the German manufacturer IP44.de blends with nearly any façade and spoils it with harmonious light. Klaus Nolting designed the Yo Lighting for the garden for the manufacturer IP44.de. The IP44.de Yo focuses its light upwards and downwards against the house façade, which provides for an impressive wall washing effect and a perfect accentuation. You may also install the Yo horizontally for a sideward wall washing effect. 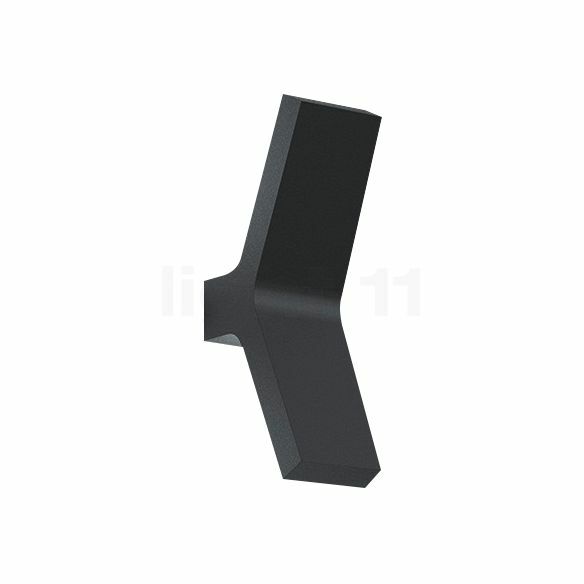 Thanks to high-quality powder-coated surfaces and a protection degree of IP65, the wall light is highly weather-resistant. It is protected against damage from water jets from any direction and absolutely dust tight. Thus, insects, rain and dust have no harmful effect at all. What is more, the exterior wall light by IP44.de is equipped with Ivylight LEDs. The Ivylight technology ensures a perfect thermal management, voltage management as well as a uniform light temperature of the individual LEDs. This extends the lifetime to an average of 50,000 hours. Tell other customers and us about your experiences with the Yo ! The Yo by IP44.de was particularly designed for lighting house façades. It supplies glare-free light that accentuates certain architectural elements in a tasteful way. However, the Yo wall light may also be used to illuminate the front door. There, the double-sided light emission proves particularly useful, as it allows for the concurrent illumination of the house number and the entrance area.